Sidecar Doughnuts - What A Dream! From left to right: Huckleberry, Maple Bacon, and Fig. 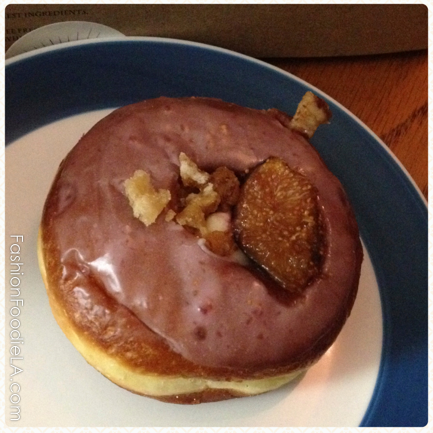 The fig doughnut was my favorite, so it is being showcased! Delicious! 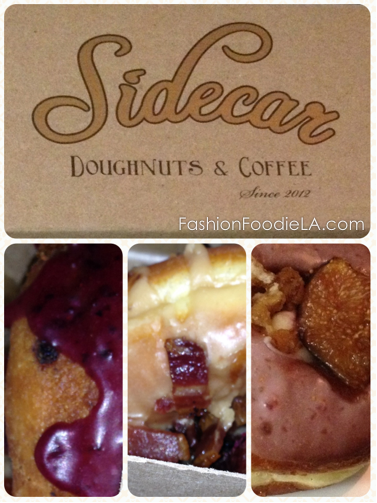 Sidecar Doughnuts in Costa Mesa, CA has the most amazing selection of creative and delicious doughnuts. It is a doughnut/coffee lover's dream! If there could be a job for someone who loves doughnuts and seeks out the best, don't you think they would be called something sweet like a doughnut-melier? Kind of like a sommelier, but for doughnuts...? Only in my dreams would that job exist! Hahaha! Back to Sidecar Doughnuts! Their flavors change monthly, but I am pretty sure the Huckleberry and Maple Bacon are staples. They even have gluten-free and vegan doughnuts! I highly recommend you try Sidecar Doughnuts. They are fresh and delicious and not made with preservatives, so they have no shelf life. What does that mean? Stuff your face Enjoy yourself!